The rules of the road are changing constantly. They make up the ever-expanding book of laws that keep people in line… or should we say “lane?” These are the basic and rudimentary topics you would cover in any California Driver’s Ed class. There’s been some construction on the ol’ road rules book, and, as of, July 1st, 2018, the updates are being implemented. Although you might have heard the contrary, rules are not meant to be broken. When they are, there’s online traffic school. But, if you would like to steer clear of paying large fines and bad moods, then read on to learn about the latest updates. We’ve outlined everything you need to know about the newest CA traffic laws that went into effect July 1st, 2018. Back in the day, there were seatbelts on all the school buses. However, the people who would wear them were made fun of or they were considered to be the uncool kids. Now, they scoff and laugh at their harassers who must follow the merciless laws bestowed on California citizens as they sit, securely, on the bust strapped in by seat belts. This law makes riding in public vehicles and transporting people, safer for the passengers. What this means for you, the passenger, is huge. 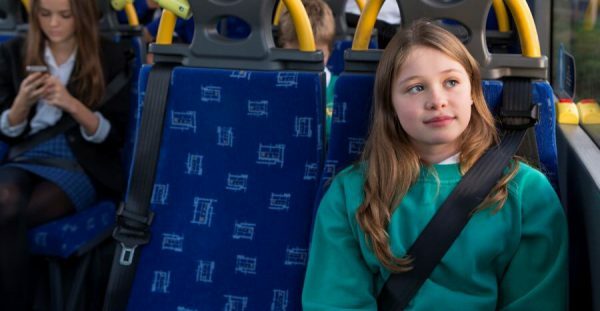 You must wear a seat belt on a bus. It also means that parents, legal guardians, chartering parties, and children of particular ages must be properly restrained in the seat or holder. It also means that bus drivers must inform all patrons of the newest law. If the passenger doesn’t follow the instructions, they will personally be fined – not the driver. The idea of the law is to increase the safety of passengers on the bus. Driving after drinking any amount of alcohol is a bad idea. Driving while impaired will cause catastrophic damage to people’s lives. It lowers your reaction time and increases the chances of you destroying property or crashing. The DUI limit is very low, running at about .08 blood alcohol concentration. Now, the DUI is lowering the bar (the only time that’s a good thing). As of July 1st, 2018, the legal driving limit, while driving a passenger for hire, will be .04 blood alcohol concentration. So, what exactly is a passenger for hire? Passenger for hire describes the services from commercial drivers. Therefore, people working for Lyft and Uber are examples of commercial drivers. They can no longer operate the vehicle with a blood alcohol concentration of .08. It’s scary to think that there are people drinking and driving you around at night – and you pay them to do it! Among the newest laws to the Golden State are the laws regulating authority and insurance. Sacramento CBS reported, “The DMV will now issue certificates for intrastate authority and verify proof of liability insurance, while CHP will regulate compliance and the safe operation of the vehicles.” If you don’t know anything about traffic laws, this sentence might sound like we just casted a spell on you. The law simply issues new regulations for private vehicles transporting passengers. Again, safety is important and is kept in mind when creating new laws to dictate how we operate on the road. This one is technical and convoluted; however, it allows regulators to observe compliance and safety operations of vehicles. This isn’t a new law, but people will begin losing their minds when they find out that Ventura, Sacramento, and Salinas DMV offices will now be in operation on Saturdays from 8:00 AM to 1:00 PM. Now, the 9 to 5’er will rejoice as they can spend their Saturday mornings standing in line at the DMV.